A loop course through the city that starts and finishes in front of the Colorado State Capitol building — and includes stretches around Coors Field and the Pepsi Center, where Denver’s MLB and NBA teams play — awaits runners at the Rock ‘n’ Roll Denver Half Marathon, 10K & 5K, which saw more than 12,000 runners and walkers cross the finish line last year. More than 8,000 of those finishers competed in the half marathon alone, a race that shows off many of the city’s many spacious parks as well as the scenery off in the distance — on a clear day, runners can see the snow-capped peaks of Colorado’s Rocky Mountains to the west. The course for the half marathon follows an out-and-back loop route that starts at Civic Center Park in downtown Denver. From there, the half marathon course takes runners first in a northwest direction away from the park, along 14th Street on the way toward the Pepsi Center, the home arena for the NBA’s Denver Nuggets and the NHL’s Denver Avalanche. After the run past the arena, the course next takes runners up Blake Street past Coors Field, where Major League Baseball’s Colorado Rockies play every summer. After runners make the turn there, they make a few more turns on Wazee, 15th, Market, 19th, 20th, & Lincoln Streets before heading over onto the long straightaway along East 17th Avenue. From there, the race will take runners on a route that heads all the way east toward City Park, where runners will make their way through the park and around Ferril Lake on three sides before continuing along East 17th Avenue. 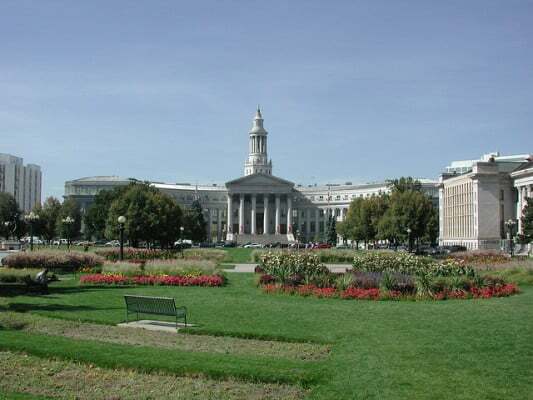 Runners will reach a turnaround point at Colorado Boulevard, after which the course continues along East 17th Avenue before reaching the finish line back at Civic Center Park. Runners will have a 4-hour course time limit for the half marathon. Nestled just east of the front range of the Rocky Mountains in central northern Colorado, Denver typically sees mild to occasionally quite chilly weather in the early fall, as October has brought record temperatures here as low as 2°F (in 1993) and as high as 94°F (in 1991). On race day (Oct. 20), the average low is 32°F and the average high is 67°F. See the race route map for the Rock ‘n’ Roll Denver Half Marathon here. To sign up for the fall 2019 running of Denver’s Rock & Roll Denver Half Marathon, 10K or 5K, register online at the event website here. Ever run in the Rock ‘n’ Roll Denver Half Marathon? Share your impressions here, or post your review in the Comments below. Have the prizes for age group awards been sent out?